Buried in the brush and trees, in a very posh part of the town of Greenwich, CT, is a ramshackle building that is all that remains of the home built by Jeffrey Ferris in the 1650s. The current street address is 181 Shore Road and the structure sits about 250 feet from the shore of Greenwich Cove. 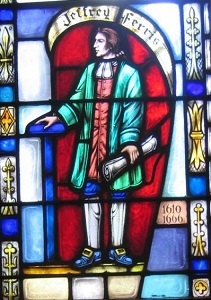 This is part of the overall stained glass window in the First Congregational Church in Greenwich, CT. If one looks closely at the lower right side, one can see Jeffrey’s birth and death year. The Greenwich Time, on July 26, reported on the appearance of a “demolition” sign on the building. The building has been demolished before, according to the paper. It was bombarded by the British Navy during the Revolution, and rebuilt after using as much of the original building materials as possible. In 1900, the house was again rebuilt, reusing materials. It is not the same house that Jeffrey built. It does sit on the same site, however. The Time, in an Aug. 6 story, notes that local historic preservationists have an interest in preventing the destruction of the building. For now, the “demolition” sign has been taken down. Jeffrey Ferris was born in England about 1610. He moved to Boston where he was made a freedman in 1635. In about 1640 he lived in the Stamford, CT area. By 1656 he lived in Greenwich. He died in 1660. This is where the lineage began. Jeffrey’s sons also owned land here (see map) and to this day some Ferris family members still live in the area. it’s interesting that Jeffrey build his homestead on the shore of Greenwich Cove. His 5th great grandson, Peter Ferris (1725-1816) built his homestead on the shore of Ferris Bay later re-named Arnold Bay in Panton Vermont. I am a direct descendant of Peter. I have been doing some research on the Ferris family, and have traced my family tree to Jeffrey Ferris. I am a direct descendant, he is my x10 great grandfather. Some day I would like to visit the land he built his home one. Jeffrey Ferris is ,my 9th grandfather. I have been working on this family tree on familysearch.org. I am planning a trip to Connecticut in late September. I am a descendant of Jeffrey Ferris through his son, John, and John’s daughter, Phebe. The old map before 1700, is great. Very informative about properties owned in Old Greenwich by the Ferris family and other well known families. 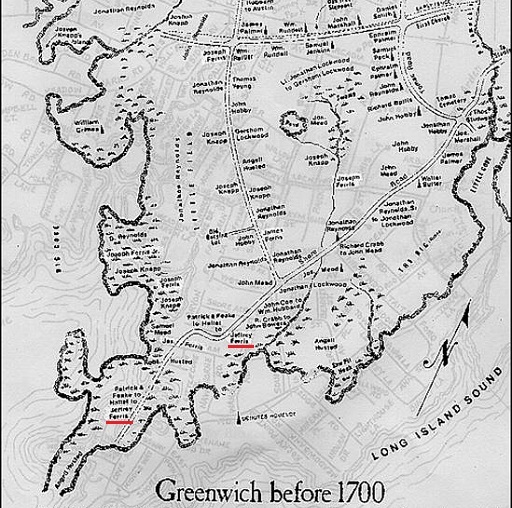 I was born and raised in Greenwich, first at the old Byram House, then at 22 Lake Avenue, then at a one story version of what is now 113 Cat Rock Road. Jeffrey Ferris is my ancestor as well. The house which is the Feake-Ferris house still stands, and has been recently renovated by a local resident, Mr. Waters. I write this note while doing other family research with Knapp and Ferris families some 200 yards away from the house mentioned here. I grew up in Old Greenwich and passed the old house every day on the way to Tod’s Point. The old house has been well preserved and Jeffrey’s descendant, Nathaniel Ferris, his house built circa 1795 still stands directly next door to the old Feake-Ferris house. I am a descendant of Ferris by three different bloodlines. Anyone reading these posts please know, that the old homestead is preserved and in good hands, and that the Ferris’s still remaining in Greenwich, among many other good and diligent residents such as Mr. Franco, are making sure the oldest parts of Greenwich town history are saved, maintained and forever preserved. Recently discovered my direct ancestor, Susannah Norman Lockwood, married Jeffrey Ferris late in both their lives and resided with him in the Feake-Ferris House – which I have passed innumerable times on my way to Tods point.